Dr Renu Khator is any way tall. 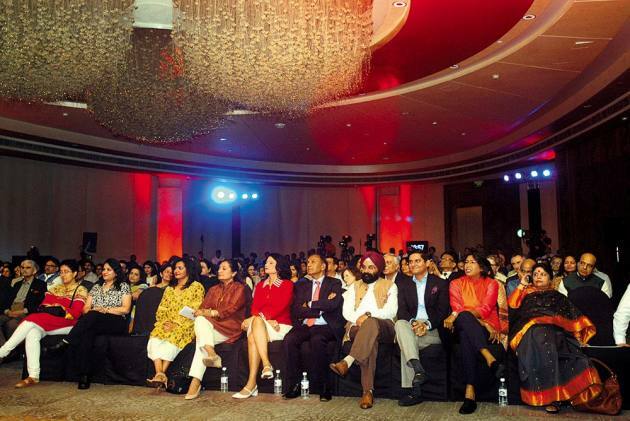 But she loomed taller still as she rec­ounted her life story before a packed audience in New Delhi last week. The occasion was the Outlook Speakout event and she was delivering the second Vinod Mehta Memorial Lecture held annually to pay tribute to our founder-editor. As Khator traced her remarkable journey—from a girl born in Farrukhabad of Uttar Pradesh to the longest-serving Chancellor of the University of Houston System in the United States—jaws dropped in disbelief and respect for her hit the roof. Till the age of 19, she couldn’t speak even a word of English. But married off and sent to the US, she scripted her own success story. Besides watching programmes on television to learn English, she doggedly pursued her education. The rest is history. In hindsight, there couldn’t have possibly been a better person to deliver our event’s most important speech than Khator. Her single-minded determination and unflinching doggedness to excel have lessons for all of us. It tells us that where there’s a will there’s a way. Since the overarching theme of this year’s Outlook Speakout was women empowerment, Khator’s address narrating her own journey to the top assumed greater significance. Outlook Speakout is aimed at encouraging participants to speak out and also be outspoken. Khator’s oration tugged many hearts and set the tone for the evening that witnessed several other women achievers narrate their own stories, perhaps not as dramatic as that of Khator but no less powerful. Former beauty queen and Bollywood actress Sushmita Sen talked eloquently about how she scales challenges and strikes a balance between being a successful model-actor and an affectionate mother. Ekta Kapoor—Indian television’s first lady whose production house dominates the world of soap operas and largely determines the staple that Indian families get to watch—also bared her soul recollecting her close brush with failure. She had borrowed money from her father, the famous actor Jeetendra, but struggled to succeed until she was down to the last few lakhs of rupees. The moral of her story: she had the heart and refused to give up. If the idea of Outlook Speakout was to provide a voice to women, we more than succeeded. As the ladies spoke, one inspiring story competed with another and the auditorium was awash with personal accounts of what women—48 percent of the Indian population—are capable of. Gender inequality is a fact of life and large parts of India even today prefer a boy over a girl. Our mothers, sisters and wives face gross injustices, but as our achiever-participants forcefully pointed out, their indomitable spirit was far from broken. Pincky Balhara, for that matter, packs tonnes of that in her slim frame. The 19-year-old student of Delhi’s Gargi College has returned from the recently-concluded Asian Games with a silver in a combat sport, and is aiming higher, possibly an Olympic Gold. “When I travel, I want people to notice and say, there goes Pincky,” she said. Purnima Devi Barman, a wildlife biologist from Assam, has already forced her husband to take note of her passion for her work. “He was exasperated, and I threatened to climb up a 100-feet high bamboo platform unl­ess he comes around,” Barman recounted in jest, sending the crowd in splits. Outlook Editor Ruben Banerjee giving the welcome speech. Balhara and Barman were two among the several achievers Outlook felicitated. The others inc­luded former cricketer Jhulan Goswami, Karnataka’s first woman IPS officer D Roopa Moudgil, wildlife conservationist Belinda Wright and naval officers Lieutenant Comman­ders Vartika Joshi and B. Aishwarya. Many others such as AAP leader Atishi, actress Parvathy, parliamentarian Ranjeet Ranjan, and Congress social media head Divya Spandana shared their take on challenges they routinely face. The audience listened in silence and clapped enthusiastically in cycles as the ladies spoke. Union minister for textiles, Smriti Irani summed up the proceedings succinctly as the evening’s guest of honour. “Women have never had a problem speaking up. They have a problem in being heard,” she said. Everyone gathered readily agreed. It’s about time the women achievers are heard and their feats emulated.